Two CONCACAF Champions League games tonight, each determining a semifinalist. First, after winning the first leg at home 2-0 on goals by Javier Orozco and Christian Gimenez, Cruz Azul travels to Estadio Corona of Torreon, home of Santos Laguna, runner-up to Monterrey in the recently completed Torneo Apertura. One would expect Santos Laguna to win at home, and it would be a question of aggregate score, but that is not what happened. Instead, the man pictured here, Emanuel Villa of Argentina, was the best pro soccer player in North America tonight. Shortly before halftime, Villa scored a goal in the 37th minute, on a sweet pass from Javier Aquino. Villa then assisted a goal right after halftime by his countryman Christian Gimenez in the 50th minute. But Villa wasn't done. He blasted another shot off his head past Santos Laguna goalie Oswaldo Sanchez (didn't he used to be...you know, good?) for a 3-0 lead on yet another perfect cross from Aquino. At that point, Los Cementeros protected their star forwards, removing Villa in the 58th and Javier Orozco in the 65th minute for defensive subs. That, and Gimenez got his second yellow card in the 64th minute, forcing Cruz Azul to adopt a defensive mentality. With the man advantage, Santos Laguna got a meaningless consolation goal in the 71st minute. Colombian Carlos Darwin Quintero, easily the best player on Santos Laguna, beat Cruz Azul goalkeeper Jose de Jesus Corona and smacked a good shot off the post. It bounced to teammate Christian Benitez of Ecuador. Benitez easily put the ball into the net, but it was too little too late. 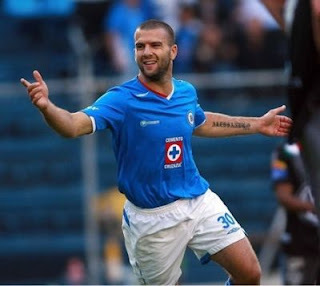 The final score was3-1 in favor of Cruz Azul, who won 5-1 aggregate. Cruz Azul will almost certainly face Monterrey in the semifinal, as the current Mexican champions defeated Toluca 1-0 in Toluca and host Los Diablos Rojos tomorrow in the second leg. In the all-MLS quarterfinal, the Columbus Crew could only tie Real Salt Lake at home 0-0 a week ago, and with a starting goalkeeper, Ray Burse, who was signed a week ago as the best goalie hanging around Columbus Ohio at the time when Will Hesmer and Andy Gruenebaum both were injured, the second leg would be an easy win for RSL at Rio Tinto Stadium. In the 23rd minute, RSL showed nice teamwork as Andy Williams of Jamaica passed to Javier Morales of Argentina, who in turn set up Alvaro Saborio of Costa Rica for a definitive goal to put RSL up 1-0. Morales doubled the lead in the 36th minute on another assist by Williams. The Crew came to life to start the second half, with a quick goal by Andres Mendoza of Peru on a nice feed from Eddie Gaven in the 49th minute. Trailing 2-1, another goal would put Columbus through on the away goals rule. But, Real Salt Lake were the better team. After a series of saves on Saborio by Burse and the crossbar, Morales scored his second goal in the 77th minute, despite teammate and countryman Fabian Espindola being offsides and even jumping to avoid an illegal touch of the ball. Lastly, in the completely unnecessary 95th minute, Andy Williams scored on a direct free kick. The final score of the game and aggregate match was Real Salt Lake 4-1 Columbus Crew. Real Salt Lake will play against the winner of Olimpia of Honduras against Saprissa of Costa Rica. Saprissa won at home 1-0 last Thursday, and they will play the second leg at Estadio Tiburcio Carias Andino in Honduras this Thursday.